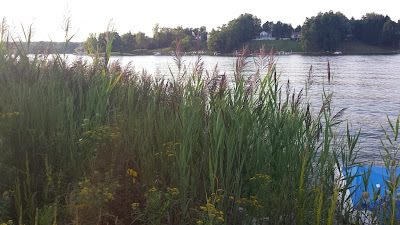 I visited my old friend, the prairie beach park, in mid August 2015, about fifteen months after installation. 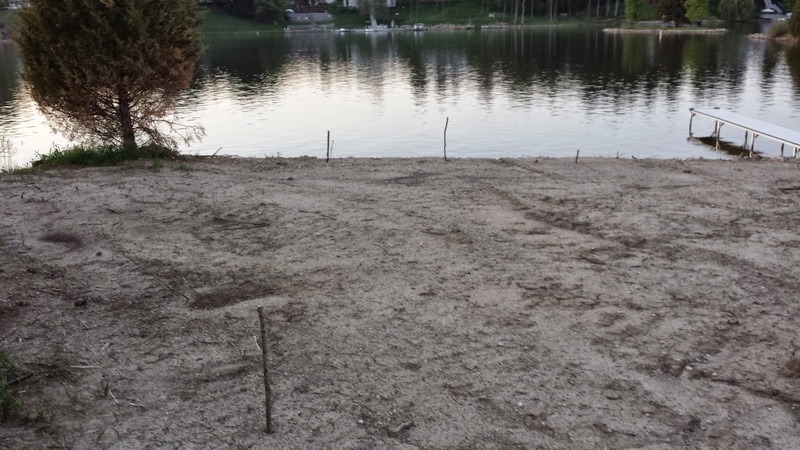 For reference, here is the post detailing the site and initial installation work, and the post about the site visit in Fall 2014. To summarize my observations from the visit, the establishment of this novel ecosystem is a mixed bag of good and bad things happening. If you compare the above photo with this photo from May 2014 and this from Fall 2014, you can easily observe the progression of prairie growth. There remains much room for improvement. Although many areas of the prairie are still thin, achieving denser growth is only be a matter of time! First, the good, because I like to include pretty photos! 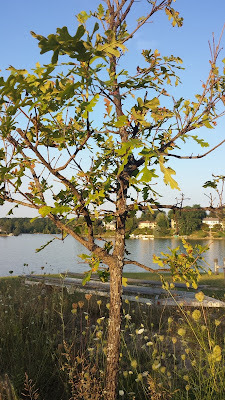 The Quercus macrocarpa specimen seems to be losing a few branches. But, considering it is still alive after all this time, I am sure the root system has continued to expand, and its continuous process of growth and death and regrowth appears to be off to a good start. Coreopsis tinctoria, Plains Coreopsis...sprouted from the annual seed mix. 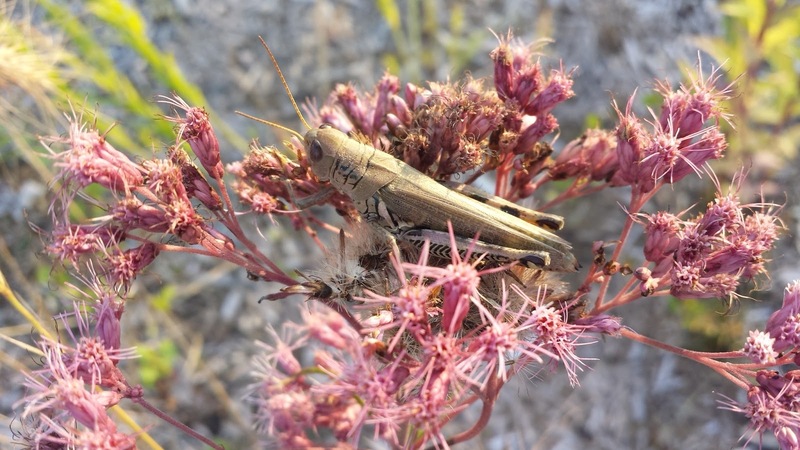 A beautiful grasshopper specimen, hanging out on the flowers of a Eutrochium maculatum, (formerly Eupatorium maculatum), Joe Pye Weed... grown from a plug from Wildtype Nursery. 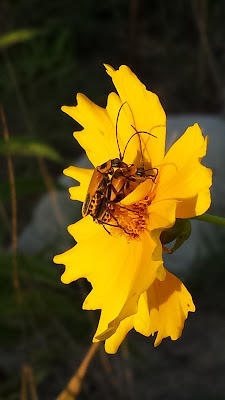 Two unidentified beetles doing their thing on Coreopsis lanceolata, Lance-leafed Coreopsis...sprouted from Native Connections Dry-Shortgrass prairie seed mix. 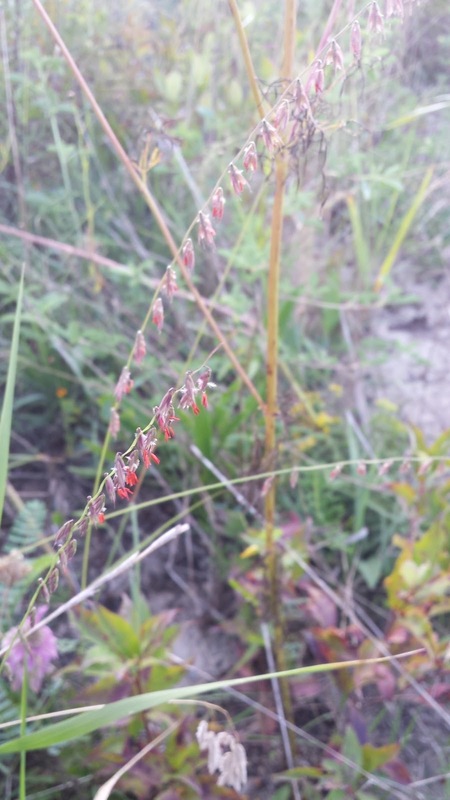 Bouteloua curtipendula, or Side-oats Grama, sprouted from Native Connections Dry-Shortgrass prairie seed mix. 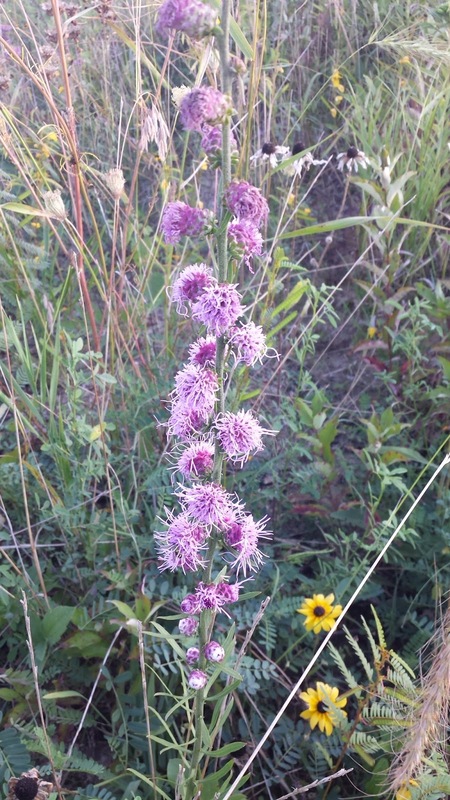 This is a Liatris spp. (not L. cylindricea). I also observed some specimens of probably Symphyotricum novae-angliae (formerly Aster novae-angliae). These two species were not included in either seed mix. So, both species were either here naturally or sneaky inclusions in the seed mixes, which, given how the seed mixes are collected and prepared, would not be surprising. Both are native species, so both are most welcome! 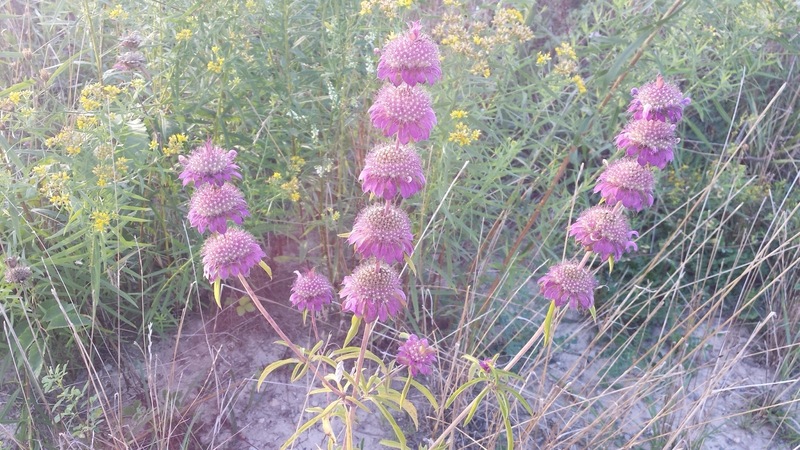 Monarda punctata, more commonly called Horsemint, with its surprising flowers...sprouted from Native Connections Dry-Shortgrass prairie seed mix. 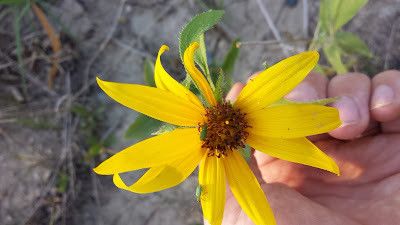 Helianthus occidentalis, more commonly called Western Sunflower...sprouted from Native Connections Dry-Shortgrass prairie seed mix. The plugs from Asclepias syriaca and Rudbeckia hirta survived at such a high percentage, that you can basically see the line of where the plugs were planted. 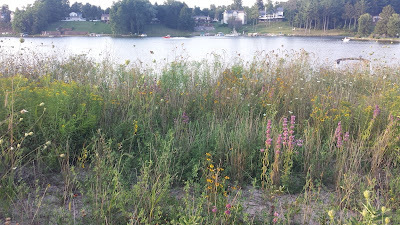 Several native plants had significant populations. Observing plants, which grew from seeds and plugs (which cost a good deal of money), now producing seeds (free!!!) and naturally spreading themselves over the prairie is highly satisfying! 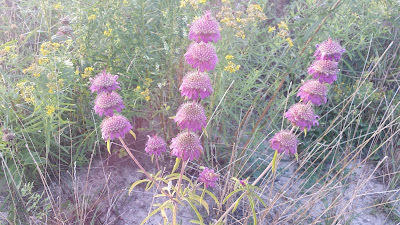 I observed possibly significant populations of Asclepias syriaca, Cassia fasciculata, Coreopsis lanceolata, Coreopsis tinctoria, Elymus canadensis, Euthania graminifolia, Fragaria virginiana, Monarda punctata, Penstomon hirsutus, and Physostegia virginiana. Only time will tell if these populations are viable and remain adequately competitive, but these seem to be off to a promising start. 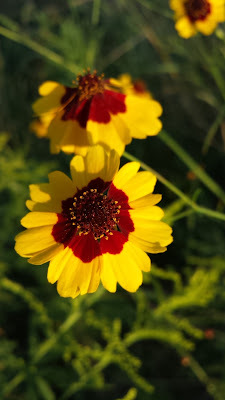 Other species that I observed, which probably sprouted from the Native Connections Dry-Shortgrass prairie seed mix were Anemone cylindrica, Asclepias tuberosa, Bouteloua curtipendula, Bromus kalmii, Echinacia purpurea, Helianthus occidentalis, Lobelia cardinalis, Panicum virgatum, Rudbeckia hirta, Sporobolus heterolepis ... I only observed one or a few specimens of these species. Second, the bad. I did not observe numerous species included in the Dry-Shortgrass Prairie Seed Mix. Various explanations are probable. One, I just missed seeing the species or did not identify it. 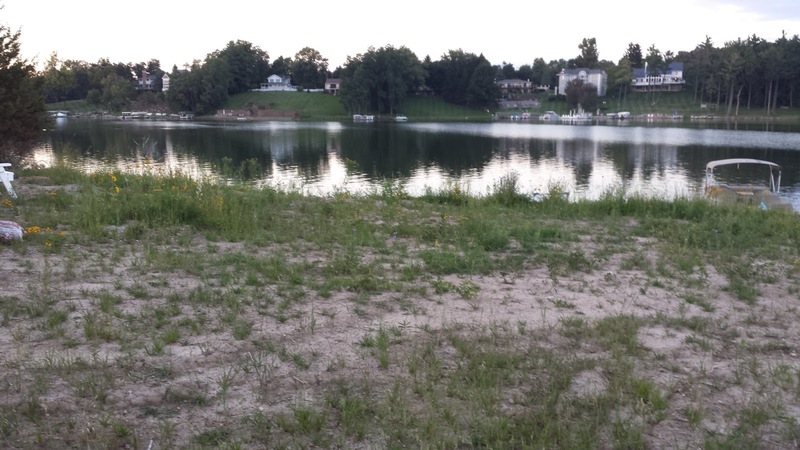 Two, their occurrence is noticeable in a different season then when I visited. Or three, the germination conditions were not appropriate for the particular species. Hopefully, these seeds remain part of the seed bank and, as conditions change, their successful germination becomes more likely. 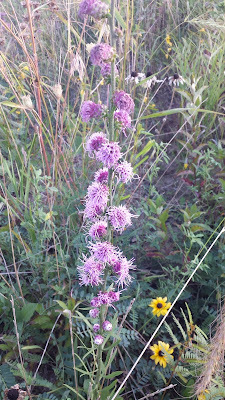 Most surprisingly missing was, Schizachyrium scoparium, which was a large constituent of the mix. Third, the super ugly! Some non-native invasive species were taking advantage of the disturbed soil and, unfortunately, moving in. 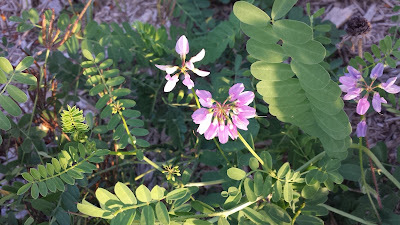 I observed probably significant populations of Securigera varia or Crown-Vetch (probable ID, photo below), Eleagnus umbellata (mentioned in previous post), Queen Anne's Lace, and, possibly, Phragmites australis (probable ID, photo above). Mowing the prairie early Spring 2016 (especially the areas with Crown-Vetch and Autumn-Olive). There is not adequate fuel for performing a thorough prescribed burn yet. 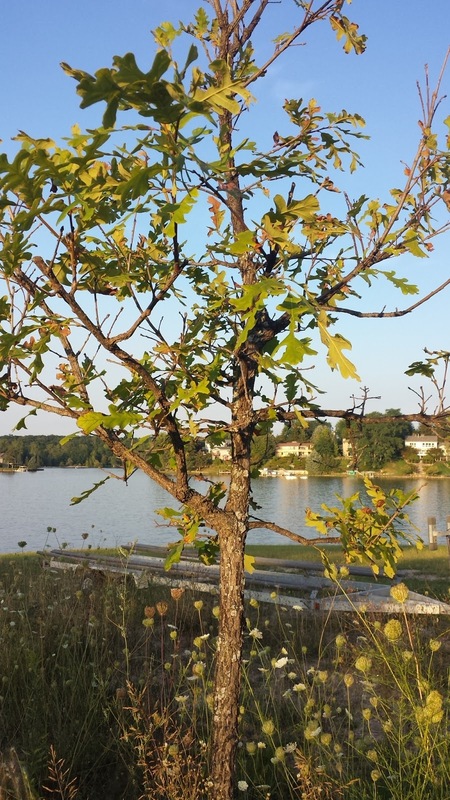 Removal or cutting and painting the Autumn-Olive. 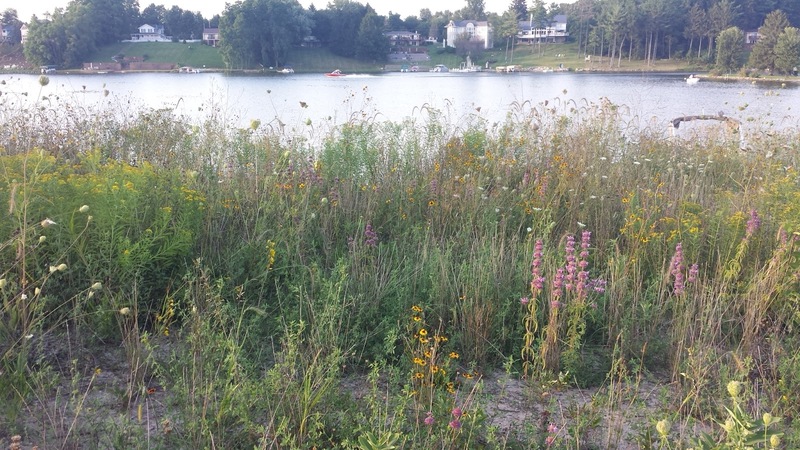 There are some other native species, which might like to compete in this space. So, I might recommend planting those plugs or spreading those seeds. Once the fuel-load is adequately dense, performing a prescribed burn. After breaks are mowed, the actual burning would likely take just a few minutes. If a burn is not possible, mowing annually or bi-annually. Additional discussion needs to occur for deciding the best, most appropriate, course of action.